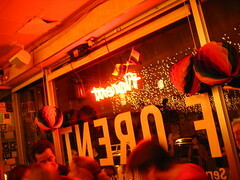 This is from the last night party at Florents. We ate and sang and laughed, few cried and many smiled. It is an end of an era in New York City, and the places that accepted everyone and anyone are dying out. The pavement is no longer drenched in blood and tears, but with cosmo's and blank stares. You have to look hard to find even the hard anymore. But this night was special, and will be remembered.